Afghan-American novelist Hosseini follows up his bestselling The Kite Runner with another searing epic of Afghanistan in turmoil. The story covers three decades of anti-Soviet jihad, civil war and Taliban tyranny through the lives of two women. Mariam is the scorned illegitimate daughter of a wealthy businessman, forced at age 15 into marrying the 40-year-old Rasheed, who grows increasingly brutal as she fails to produce a child. Eighteen later, Rasheed takes another wife, 14-year-old Laila, a smart and spirited girl whose only other options, after her parents are killed by rocket fire, are prostitution or starvation. Against a backdrop of unending war, Mariam and Laila become allies in an asymmetrical battle with Rasheed, whose violent misogyny—"There was no cursing, no screaming, no pleading, no surprised yelps, only the systematic business of beating and being beaten"—is endorsed by custom and law. Hosseini gives a forceful but nuanced portrait of a patriarchal despotism where women are agonizingly dependent on fathers, husbands and especially sons, the bearing of male children being their sole path to social status. His tale is a powerful, harrowing depiction of Afghanistan, but also a lyrical evocation of the lives and enduring hopes of its resilient characters. Without a doubt the best book I've read all year. The portrayal of the women protagonists and their hardships was realistic and eye-opening considering some of this treatment continues today in Afghanistan. I loved this book! Released at the December 2007 Boston Bookcrossing meeting. Picked up at December 2007 Boston Bookcrossing Meetup. This was an exceptionally good novel. The Kite Runner was so tremendous that I worried I wasn't up for a second book that takes place in the same place and time. 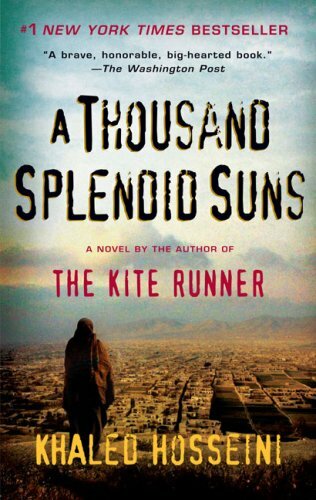 But the characters and action are completely independent of The Kite Runner, and Hosseini is simply a fine writer. Being released at the January 2008 Boston Bookcrossing Meetup. Picked up at the Boston Bookcrossing Monthly Meetup. Looking forward to reading it! It has been on my TBR list! Finally got around to reading this and I'm so glad I did! Will release it soon. "Devastating" and "beautiful" often sound cliché when they are paired together, but in the case of A Thousand Splendid Suns, these words are more than apt. Part of the power of the book is to that there are many Mariams and Lailas all over the world for whom this story is not a fiction. Hosseini manages to passionately advocate for them without hyperbole or an excess of drama, spinning a tale that is tragic, but so human. The horrors in the book are at times almost unreadable, but Hosseini compels you to read further because you feel you owe it to the characters who persevere. Ultimately, you realize you owe it to the many people in the world for whom bombs are a daily reality, and the frightening relativism of terrorism inside a house vs. outside a house is perhaps the sharpest edge of the knife. In a book with so little that is redemptive, I was startled by the ending. It is perfect--not happy, nor sad, but the perfect way to let us know that the story goes on well beyond the last page of any book.